While Las Vegas is seen as an oasis in the desert, in the Far West but not really part of it – that’s not entirely true. There are a number of Western attractions that are worth checking out. At Spring Mountain Ranch – down Charleston just to the west of Red Rock Canyon and not 20 miles from downtown Las Vegas – you can find a daily live-action old- fashioned western shoot-out at high noon (though the shows run several times daily). Spring Mountain Ranch was a private ranch dating to before Las Vegas, but it’s been turned into a state park and fascinating attraction giving you a sense of what the West was like before there was Las Vegas. 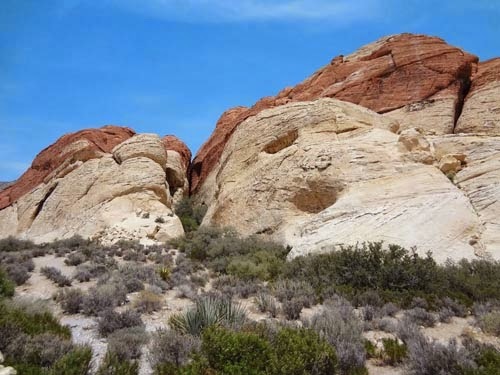 Closer to town – just half a mile down the hill from Glitter Gulch and the Fremont Street Experience and right off of Las Vegas Boulevard (which is what The Strip is officially called) is the Old Mormon Fort. More than 50 years before what is now Las Vegas was created by the Acheson Topeka and Santa Fe Railroad in 1905, a hearty band of Mormons tried to create a trail from Salt Lake City to Los Angeles, following a path that later became I-15, the Interstate that runs from Los Angeles, through Las Vegas to Salt Lake City and from there to Canada. The Mormons were 50 years ahead of their time, and the Fort remains, a memorial to hearty pioneers who tried to settle the bleak desert before railroads or telegraphs. But setting aside real and made-up history, Las Vegas has also become a Mecca to another attribute of the Far West. Guns. Here, at a number of locations, you can rent and shoot guns in a safe and controlled environment – and, for the right price … which really isn’t very much, all things considered … you can even shoot a machine gun. Best I can tell, the first place to offer this service is, appropriately known as The Gun Store, on East Tropicana just three or four miles from the MGM Grand. It was here that I fired my first machine gun – a real high-energy adrenaline rush – and it is here where literally hundreds of visitors to Las Vegas come every day to rent and fire one of a wide range of modern and classical machine guns and sub-machine guns. The Gun Store is owned by Bob Irvin, a former Las Vegas police officer, and he led the way in Las Vegas. More recently, a number of other ranges have created indoor shooting experiences – some of them priced at well over $1,000 – and I’m sure they’re a rush, too, but for my money, whenever I have guests in town who might want to try their hand, I take them over to the range at the Gun Store and watch them blast away with real, legal, machine guns. Old West or new west, Vegas has more than casinos.